A strong storm system will move across the ArkLaMiss region this Sunday and bring a moderate risk for severe weather. Damaging winds, hail and a few tornadoes will be possible. 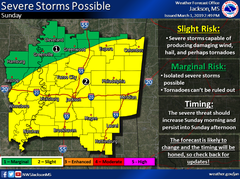 Be sure to monitor this severe weather potential as there will be updates to the current outlook as we approach Sunday. There is also a slight risk for flash flooding as the strong storm system moves across the ArkLaMiss on Sunday. 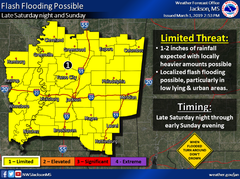 One to two inches of heavy rainfall is forecast and given the already saturated soils, it will not take much more to cause additional flooding problems.